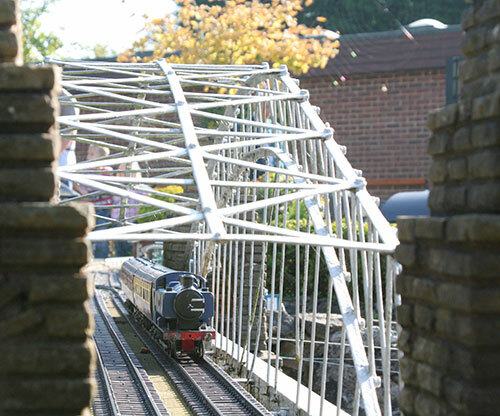 A driver’s eye view of the Gauge 1 model railway at Bekonscot Model Village, Bucks. It’s a 10 scale miles model garden railway of 1:32 scale, in a 1:12 scale miniature village. The line was started circa 1929 and has been updated continuously for 80 years. We strapped a camera to the front of one of the engines and sent it off – we’ve added some subtitles so you can see what you’re passing. Maryloo Signal Box and Relay Room (the green building to its side) is the hub of all Bekonscot’s technology. The working Westinghouse ‘L’ lever frame came from Purley Signal Box on British Railways Southern Region and is backed up by an automated computer control system. The frame can be used by the Signalman to operate the tracks and signals around Maryloo, while outlying parts of the network are managed by the computer. The second lever frame (a Westinghouse ‘N’ style frame) is from Ruislip Gardens on London Underground. Between the frames and running lines is a Relay Cabinet. In here, you can see the relays switching current between sections of track and signals, as the trains rattle around outside. The computer system has been programmed by an expert Railway Software Engineer, who later went on to develop signaling for London’s Jubilee Line Extension. The trains can be pre-set on their own routes for the day, obeying rules appropriate to their type – but can be overridden by the Signalman manually on the lever frame or by altering the computer settings. Goods trains and expresses use passing loops to bypass platforms, whilst local passenger trains are sent off to stop everywhere across this massive garden railway. Some trains will use the Evenlode branch, whilst others don’t fit the tight tunnels. The computer develops the routes intelligently throughout the day to ensure that the model railway keeps running as it should. Each train set has a tiny radio beacon inside it to allow the computer to confirm its identity, location and speed. The line is broken down into three big chunks: Red Mainline (anti-clockwise), Blue Mainline (clockwise) and the Blue Loop (the branchline to Evenlode coal mine). Each are over 150m long. To exchange trains between Red and Blue, they can be sent off down the loop and then back on to the other line in the opposite direction, or switched manually at Maryloo. Take a look at the trackplan for more information. When not maintaining the garden railway routes or stock, the Signalmen can often be found to be controlling the lever frames themselves. Rather like a game of chess, it takes forward planning and a great deal of skill. Trains can’t crash into each other as the Gauge 1 model railway layout is split into many short lengths (blocks) of track, and interlocking means that only one train can be signaled into a block at a time. This is just how real trains on Network Rail operate. The Signalman can see the location of the trains via the overhead illuminated track plan, or his computer monitor for more accuracy. You’ll see 23 levers on the L-frame; black ones are points and red ones are signals. As a general rule, a point lever is pulled first, and then the corresponding signal lever is then pulled. This signals to the ‘driver’ of the model railway train to proceed over the point and into the next section. There are occasionally accidents and incidents on the Gauge 1 railway – usually caused by small hands getting too close to the trains! Most visitors are unaware of the technology that goes in to running this incredible trainset – so stop a while at the Signal Box and take a look at the trains and equipment. Any duty Signalman will be happy to talk to you more about it. We’re jolly proud of it all and love to share our enthusiasm!